Monday was the start of Banned Books Week, a celebration of the freedom to read. This annual event, launched in 1982 in response to a surge in the number of challenges to books in schools, bookstores and libraries. is sponsored by the American Library Association, the American Booksellers Association, the National Council of Teachers of English, and a slew of other worthy organizations. 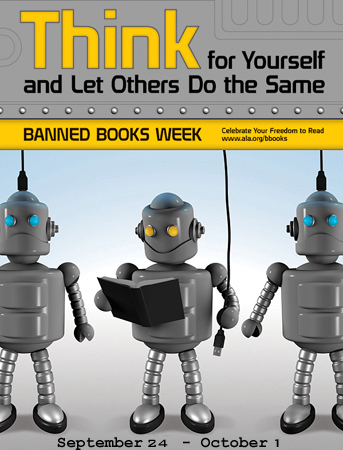 Why should anyone care about Banned Books Week? I'd like to turn to YA author Ellen Hopkins, an author whose edgy teen books deal with drug addiction, prostitution, and other difficult issues. I studied her works and life for a library school project, and was deeply moved by her fierce commitment to intellectual freedom and the freedom to read. All her books have been challenged at one time or another, and, perhaps more shocking, she has been challenged as a speaker; in 2009 an invitation to speak at a school in Oklahoma was rescinded, as was an invitation to participate in a Texas Teen Lit book festival, after complaints by a few parents. "I don't believe any one person should have the power to decide what everyone else does or does not get to read. Every reader has a different life experience and what might be "too much" for one may speak loudly to another. If you don't like a book, don't read it. But don't dare try to speak for everyone else!" If you'd like to participate in a fun way in Banned Books Week, check out the Banned Books auction of original children's books art, donated by an array of wonderful illustrators including Bruce Degen, Jon Agee, David Shannon, Anna Dewdney, and many more. Also, you can join the virtual Read-out lasting all week, in which you can upload videos of yourself reading a banned book. Words do have power. In America, the First Amendment grants us the right to believe, to worship, to speak our minds as we please. There is a responsibility that comes with that, however...too many of us word people find the easier path not to write with courage. Not to stand up for our beliefs. Not to push back against would-be censors or the people who use words to divide. I’m pushing back today, as a responsible American. This is my country, and I love it, and I love the freedoms it was founded upon. If you want to burn a book, it’s your right. Burn it. And I’ll keep writing new ones to replace it. Thank you Ellen, and all those who fight against abridging one of our most fundamental freedoms--the freedom to read. 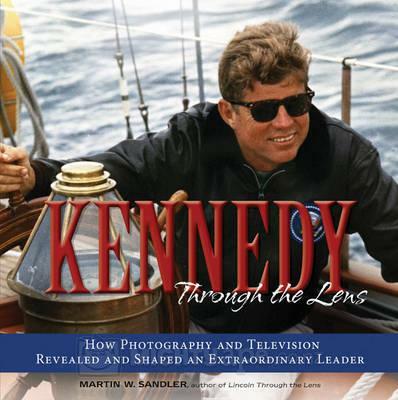 This handsome book equally suitable for young people or adults looks at one of our most popular presidents, John F. Kennedy, and the role photography and television played in shaping his presidency and his legacy. An oversize book laid out with a series of two page spreads, the book provides not only fascinating text but a captivating graphic design. Each two page spread has a different striking color scheme, with a quotation from JFK appearing in a colored box near the to of each spread. 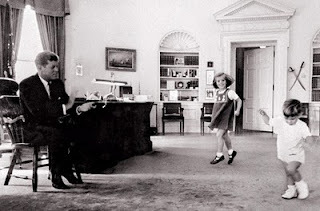 And what president could be better suited to this photo essay format than the handsome, youthful Kennedy complete with his adorable children and beautiful wife? Sandler explains how Kennedy was the first president to have an official White House photographer, and to permit informal photos throughout the White House, particularly private moments with his family. He was also the first president to widely use color photography and to understand the power of television. Reproduced are famous photos like John John hiding under the Oval Office desk, but also photos that were new to me such as a wonderful color photo of Caroline and John John dressed up in Halloween costumes and plastic masks, visiting their father in the Oval Office, and another with the two children leaping and dancing for their dad, who applauds them from a nearby chair. 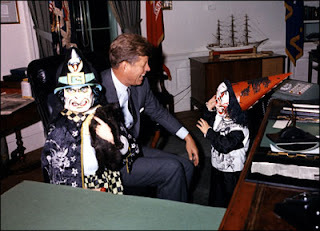 And who can resist of a photo of JFK being nibbled on by one of Caroline's ponies? But this book is not just a succession of charming photos of the Kennedys on land and sea. There's also an overview of all key aspects of his life and presidency, from discussion of his privileged beginnings, his war service, the space race, Cuban Missile Crisis, civil rights, Vietnam, to his "secrets" (his extra-marital affairs and serious medical issues) to his assassination and legacy. There's plenty of information for a school biographical report, but the book is also great for tweens and teens interested in history who would like to explore the life and legacy of this remarkable man. Author Martin Sandler is the award-winning author of many books for young readers, including Lincoln Through the Lens and The Dust Bowl Through the Lens. I don't usually order books from England before they are even available in the U.S., but when I read about Prisoner of the Inquisition in an article about England's prestigious Carnegie Award I couldn't help myself. 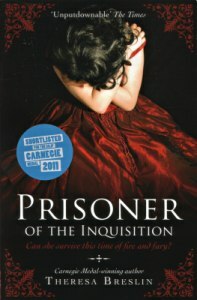 Prisoner was short-listed for this year's Carnegie and won the Carnegie Shadowing Award (books chosen by young people who shadow the official judges and is written by a well-known author of historical fiction in her native Great Britain, Theresa Breslin. One of my favorite historical fiction titles from back in my own teen days was Samuel Shellabarger's swashbuckling Captain from Castile, (adapted into a famous film with Tyrone Power), also set in the dark days of the Spanish Inquisition. Scottish author Theresa Breslin's young adult novel focuses on some of the same themes of adventure, romance, revenge, and abuse of power by the church that I relished so many years ago in Shellabarger's novel. In alternating chapters we meet two teenaged characters: Zarita, the thoughtless, spoiled, only daughter of the wealthy town magistrate, and Saulo, son of a beggar. Their lives intersect when Saulo's father, needing money to save his sick wife and hungry son, begs at the church where Zarita is praying, grasping her hand in desperation. Saulo's father is soon cruelly executed for daring to assault Zarita, despite her pleas that the man does not deserve to die. Saulo himself barely escapes the executioner's rope, and swears revenge on Zarita and her family. Their stories are then told in parallel; Saulo is thrown into the harsh life of a galley slave, where through his wits, he is able to learn some navigation, is pursued by pirates, and eventually becomes acquainted with Christopher Colombus, a confident sailor from Genoa who hopes to gain patronage from the Spanish monarchs to explore an alternate route to the Indies. Zarita, on the other hand, has troubles of her own. The Inquisition has come to her town, and with it fear, suspicion, and cruelty. No one is immune from the Inquisitor's tactics, even Zarita's aunt, a nun, a simple-minded relative, and Zarita herself. Soon Zarita and Saulo's lives will intertwine again, in a way neither of them could ever have suspected. Can they escape the dangers of the Inquisition? I thoroughly enjoyed this historical novel about one of the darkest periods in Spanish history, although I found the transformation of Zarita's character from a self-absorbed young girl who thinks nothing of a poor beggar in the church to a kind, sensitive young woman a bit difficult to believe. Some of the other characters in the book, including Zarita's young step-mother, are also somewhat one-dimensional, but the novel effectively captures the spirit of the period and is well worth reading. I hope it will soon be released to an American audience. Teens looking for other novels about this dark period in history may want to check out Alice Hoffman's Incantation (Harper Collins, 2004). 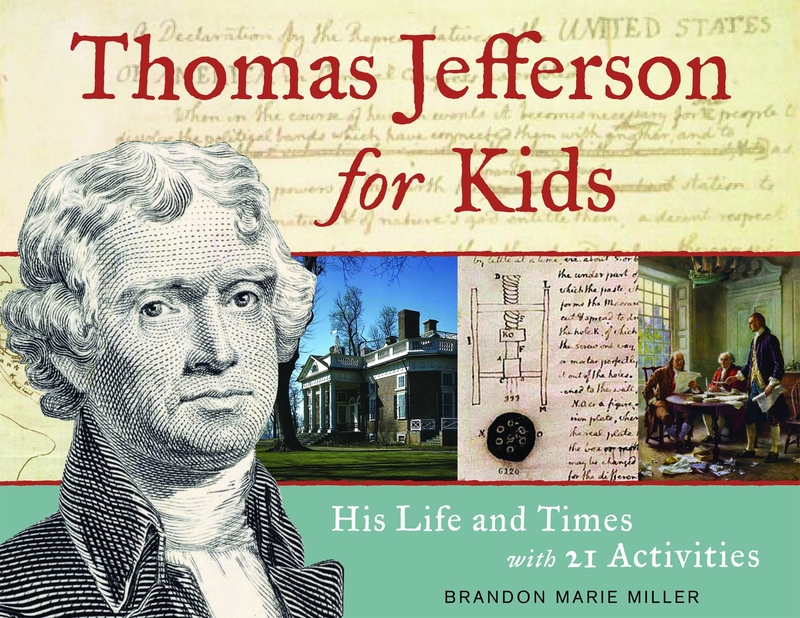 This new release from Chicago Review Press about Thomas Jefferson, one of the most venerated of our founding fathers, is a great addition to any school or public library, as well as ideally suited for use by home schoolers. Although many biographies of Jefferson are available for young people, this one is unique in including a variety of hands-on activities to enhance learning, from how to organize your library like Jefferson, how to observe the weather, grow a plant from a cutting, or paint a buffalo robe. Although I did not try any of the activities, they include copious instructions, and are well suited for upper elementary and/or middle school students. Organized chronologically, this book begins with some background on Jefferson's father, Peter, and his wife Jane. Thomas was the first of their eight children, and showed himself to have a quick mind from his earliest childhood. Jefferson went on to be a brilliant college student, often studying 15 hours a day (and without a tiger mother! ), and then studied law. We learn about Jefferson's immersion in radical politics, his family life, and his drafting of the Declaration of Independence. Later chapters explore his presidency and his founding of the University of Virginia, as well as recounting the incredible story of his death on the 50th anniversary of the Declaration of Independence--the same day as his friend and rival, John Adams, also breathed his last. Miller's volume is clearly written, and provides a fascinating look at this complex individual and his wide range of accomplishments and interests. I particularly appreciated that she does not shirk from analyzing Jefferson's many contradictions, which she summarizes as follows: "A man who believed in frugal government yet lived his own life burdened by debt. A man who hated kings and privileged nobles yet lived as an aristocrat himself. A man who believed passionately in freedom and liberty yet owned slaves who toiled for his comfort." It is the last of these contradictions which is most difficult for us in the 21st century to come to terms with. Although Jefferson recognized the evils of slavery and even condemned slavery in the first draft of the Declaration of Independence, these remarks were removed in one of 86 changes made by Congress. Slavery, though, was deeply engrained in Jefferson's consciousness; he grew up in a slave-owning household, and inherited his first slaves when he turned 21. Miller includes in her book an advertisement Jefferson placed to recover a runaway slave, describes what is known of his relationship with Sally Hemmings, including discussing the many children she bore him (a new historical fiction novel for young people, Jefferson's Sons, by Kimberly Bradley, comes out in mid-September, and will be reviewed here at The Fourth Musketeer later this fall). This volume is greatly enhanced by an abundant use of illustrations, including many full page reproductions of paintings, photographs, maps, and drawings. The large format of the book and generous use of white space make the text easy to follow, and the author makes good use of many sidebars for further explanations of different topics in Jefferson's life, from his slave Jupiter to the Hemming family to political explanations of events such as the Sedition Act. Back matter includes places to visit and websites to explore, further reading for young people, a selected bibliography, and a detailed index. A timeline of Jefferson's life is also included, as is a note to readers explaining how primary sources from Jefferson's life can include different spelling, grammar, and punctuation from what we are used to today. Award-winning author Brandon Marie Miller has previously written numerous history books for young people, including similar volumes on George Washington and Benjamin Franklin (complete with activities). She also blogs about books at the group blog Hands-on Books: Nonfiction for Kids with Fun Activities. I am delighted to offer a copy of this book as a giveaway to my readers. To enter to win a copy of this volume, please leave a comment below with your e-mail address so I can reach you if you are the winner. U.S. only please. A winner will be selected on September 15, 2011. Those who plan trips to Washington D.C. may be interested in the just-announced news that the Smithsonian will be collaborating with Monticello on a new exhibit examining Jefferson's interaction with slavery. "Jefferson and Slavery at Monticello: Paradox of Liberty" opens January 27 at the National Museum of African American History and Culture gallery in the Smithsonian's National Museum of American History.